My apartment offers you all the amenities for your best time of the year. The apartment is stylish and modern. A beautiful double padded bed with quality mattresses for a good night's sleep. The bedroom is preceded by a balcony, where you can take your meals in the warm months. From the balcony you have a magnificent panoramic view of the opposite golf course and the forest behind. Large windows give this beautiful view even in bad weather and you can even enjoy this view from the bed, maybe even with a breakfast in bed. The living room is designed by a small modern kitchen and dining area open and a spacious corner couch invites you to cuddle. The bathroom is tiled with white marble, has a vanity with storage compartments, a shower and a tub. The toilet, also tiled with white marble, is located separately next to the bathroom. Of course, both the bathroom, as well as the toilet, windows. To your apartment leads a beautiful wide wooden staircase that ends in a small gallery and leads you directly to your premises, which are arranged like a small apartment. You park in front of the entrance and need to carry your luggage just a few steps. This is also your parking space for the time of your stay. A special highlight I offer for your absolute rest and relaxation with a beautiful pool area, which is located in the back of the spacious grounds and is framed by a beautiful garden. Sun loungers, parasols and sun loungers are of course available free of charge. You can also use the on-site sauna for free until the beginning of the swimming season. Book now your spring or Summer holiday and make a holiday in the region, which already Heinrich Heine 1824 in his "Harz trip"
"I want to climb the mountains, where the dark firs rise ....."
Look at your holiday home and decide for a "time out" in Meisdorf with me. I look forward to seeing you and warmly welcome you in Meisdorf! In the warm months of the year, you can also have your meals on the balcony. This is directly in front of the bedroom and offers you at breakfast a relaxed holiday atmosphere with a view of the surrounded with trees and bushes golf course. The evening sun is then her companion in the night's sleep. Alles tp! Vermietrein sehr umsichtig und herzlich! Guter Ausgangspunkt für Wanderungen und zu den sehemnswerten Städten und Orten Wernierode, Quedlinburg und Stolberg. Auch ein Ausflug zum Brocken sollte unternommen werden! Leider war ich nur für zwei Tage dienstlich hier, aber die Unterkunft ist ausgesprochen schön und gepflegt. Für einen Urlaub mit Wanderambitionen oder Golfspieler eine tolle Gelegenheit. Ich bedanke mich ganz herzlich für die netten Worte zu meiner Ferienunterkunft. Es ist schön, wenn all die Mühe, die man sich als Gastgeber macht auch bei den Gästen ankommt und sie es wertschätzen. Dann macht auch das "Gastgeben" Spaß. Wir haben uns steht's wohl gefühlt, das Apartment ist wunderschön, der Garten und Pool sehr gepflegt und wir hatten dort eine sehr angenehme Zeit. Vor allem die Vermieterin ist eine sehr symphatische Frau. Alles in Allem können wir unseren Aufenthalt nur mit sehr gut bewerten und können anderen auch einen Aufenthalt hier empfehlen. Ich freue mich sehr, dass Ihnen die Zeit in unserem schönen Meisdorf gefallen hat und Sie sich bei mir willkommen fühlten. Sie waren auch wunderbare Gäste und da ich noch neu als Vermieterin bin, haben Sie mir mit Ihrer Freundlichkeit auch geholfen, den Umgang mit Gästen in einem richtigen Maas zu gestalten. Danke dafür und natürlich für Ihre herzliche und überaus positive Bewertung. 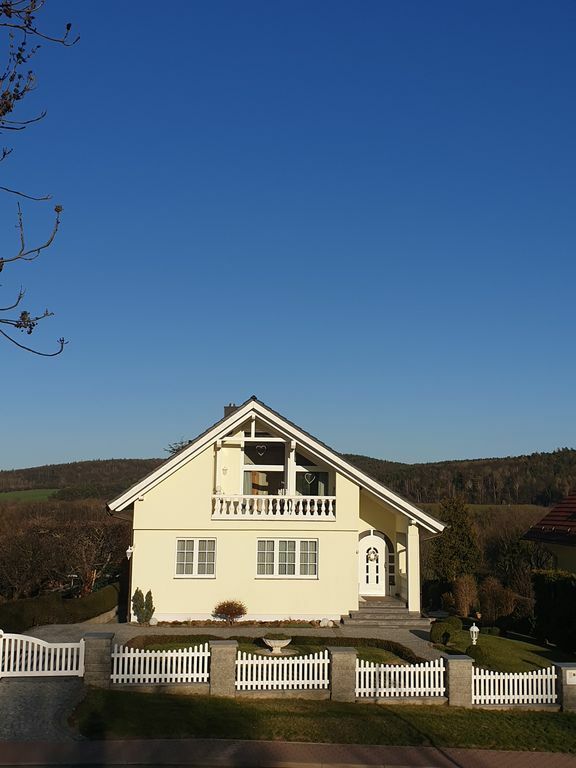 Your apartment is located in the town of Falkenstein / Harz in the district of Harz in Saxony- Anhalt. Meisdorf, as a district of the city Falkenstein, has about 1100 inhabitants and in 2000 became a state-approved resort. Meisdorf and is also called the "gate to Selketal". Nestled in a beautiful wooded landscape and for nature lovers a true paradise. Important sights are the church from the 14th century. Century, the castle Meisdorf and the Museumshof. The surroundings of Meisdorf offer extensive forests with numerous signposted hiking trails. In addition, there are many historical places nearby. Worth seeing are u. a. the castle Falkenstein, the Konradsburg and the castle grounds in Ballenstedt. Each of the listed buildings is also a stop on the Romanesque Road. Historic places such as Quedlinburg, Thale, Wernigerode and the highest mountain of the Harz, the Brocken, should definitely be on your exploration list. Quedlinburg, 23.2 km away, will delight you with its half-timbered houses and world-famous marketplace. Also Thale can be reached by car in about 28 minutes. Travel tips include the Hexentanzplatz with the Thale Mountain Theater, the Rappbode dam with zip line and reservoir, the Roßtrappe with the legendary granite rock at an altitude of 403m. In 40 minutes by car you reach Wernigerode with its beautiful castle and a magnificent view of the city. Especially the old town with numerous half-timbered houses, including the medieval town hall and the "crooked house", will fascinate you. The rail network of the Harz narrow gauge railways connects Wernigerode with the station Drei Annen Hohne, where the steam-flooded Brockenbahn departs to the Brocken. The Brocken is 1141.2 m above sea level, the highest mountain in the Harz Mountains, in Saxony-Anhalt and in the whole of northern Germany. The mountain and its surroundings are part of the Harz National Park. For hikers, the easiest ascent to Brocken from the rest area and vantage point "Torfhaus" can be reached. Varied and interesting, however, is the Brockenaufstieg of Wernigerode, Ilsenburg or Schierke, albeit more arduous. In the immediate vicinity (500m and 1000m) of your apartment there are stops for public transport. Parking is available in the town center and at the "Garden House", the starting point for a visit to the "Falkenstein Castle". There, the tourists then brings a small train directly to the castle. From the courtyard of the castle a truss tower leads to the upper floors. The rooms belonging to the museum today are dedicated to various topics. The annual celebration of the Walpurgisnacht has developed in recent years to a particularly elaborate and popular customs nursing throughout the Harz region. On the 30th April and the night of the 1st In May there will be an exuberant witch and devil ride from Brocken to the Harz foreland. A special tip for nature lovers is the "Selkesicht" to be reached on foot from your holiday home. It is a beautiful viewpoint on a promontory above the Selketals and offers a fantastic view of the castle Falkenstein.